Dundas Jafine offers extended air deflector, magnetic vent covers and permanent filter. These 1" washable air filters are eco-friendly and perfect to replace your disposable filters. This reusable furnace filter is easily washed so that it can be used over and over! Order according to your hole opening in the wall. 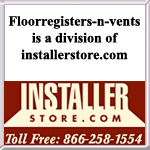 Apply these magnetic vent covers to your floor registers to conserve energy. These magnets will block vents airflow from escaping out from unused registers. Not for use on wall or ceiling registers. This magnetic register cover can be cut down to fit your floor registers faceplate. Cover the air vent to stop air flow from escaping from your duct work. Purchase with us today for one low shipping cost!